Mizuma Art Gallery is pleased to present “springing up boy” by Tanada Koji beginning Thursday, September 1st. 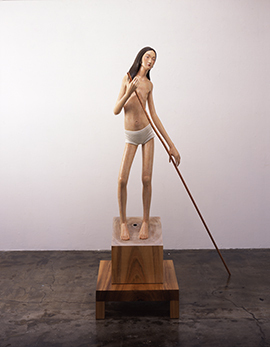 Since his imaginative scenery exhibition at the Vangi Sculpture Garden Museum (September to December 2008), Tanada’s works have been internationally renowned. He has since been invited to take part in a group exhibition at the Riso Museo D’arte Contemporanea Della Sicillia, in Palermo, Italy, and has been awarded the 20th Takashimaya Art Prize in 2010. 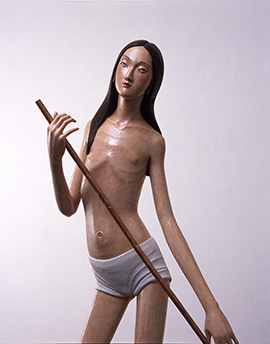 After a period of two and a half years since his last exhibition, “springing up boy” features six new Tanada’s works. Tanada’s work springing up boy, after which this exhibition is named, welcome visitors with arms outspread towards the sky. Although his body is thin and frail, he has an overwhelming presence, overflowing with a profound aura of tolerance. Recently showcased in the exhibition “Zipangu”(Nihonbashi Takashimaya), Tanada’s girl will also appear in “springing up boy.” She simultaneously exerts the powerfulness of sailing out to the ocean and her body’s brittlness. Standing on the borderline, she signifies the big step Tanada has taken. Although the fury of Nature has washed away the ordinary lives of people, in the “places” that remained have survived memories of time, of warmth, of smells and of accumulated histories. These places will once again feel the rays of the Sun on their soil, they will see trees rise again. And like these trees, the boys and girls born by the hand of the artist from one of them are springing up, like powered by the energy from the ground, pursueing the current of Life. In the aftermath of the terrible incident where human weakness was exposed raw, Tanada keeps a balanced composure of both mind and body by facing ordinary days, standing in his own “place” and by creating the lives for his boys and girls. From Thursday September 22nd to Monday October 10th, there will be another exhibition of Tanada’s, “○&－,” held at the Spiral Garden in Aoyama. The exhibition will exhibit seven new works. Please take this opportunity to see Tanada’s works at Spiral Garden as well as in our exhibition; enjoy the world of Tanada Koji.